Reelz Network in the US will begin broadcast on April 3; Canada’s History Television on April 10; Quebec’s Super Ėcran on April 3; UK’s History™ channel on April 7 and Sweden’s SVT on April 9. BBC 2 is planning a spring or summer broadcast along with France Television 3 and Switzerland’s TSR. 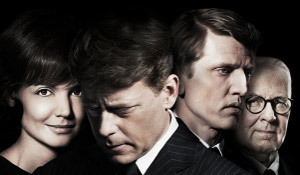 Italy’s La Sette, Spain’s Telecinco, Norway’s NRK, New Zealand’s Sky TV, Belgium’s VRT and RTBF, Israel’s IBA, Finland’s YLE and Australia’s ABC also acquired The Kennedys but have not set airdates. The miniseries will also be broadcast throughout Latin America and the Caribbean on AETN History™ networks. Several Middle Eastern nations will also air The Kennedys. An announcement will be made shortly about the other European and Asian networks that have licensed the miniseries.